ABC2’s daily satirical news show The Roast returns next month in a new ten-minute format each weeknight. The Roast has been screening on ABC2 and the Comedy Channel and online for over a year in two minute editions. While most news shows are lazy enough to only ever report the story, The Roast team live, breathe, and frequently die by the news, in a never-ending quest for their parents’ approval. They’ll eat the horsemeat. They’ll run for Pope. They’ll not only ride Clive Palmer’s Titanic II – they’ll build the iceberg that sinks it. 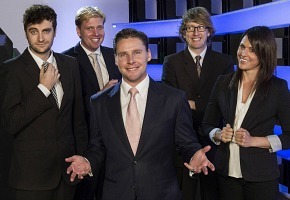 Beginning its life online in 2011 as a one-minute, news headlines show, 2012 saw The Roast double in size into a slightly bigger two-minute series, which screened on ABC2. Now in 2013, ABC2 has doubled its size yet again, and added another six minutes. Hosted by Tom Glasson, The Roast also features Mark Humphries, Clarke Richards, Rachel Corbett and Nich Richardson. These names won’t mean anything to you, but give it time. As the show’s director and head writer, Richardson is responsible for assembling this collection of young writer/performers who have never worked in television before. He assures the ABC it’s all going to turn out fine. With 150 episodes being produced over the next eight months – over 25 hours of original comedy – The Roast promises to kill more reporters on-screen than any other news show. Even Lateline. Don’t expect interviews out in the field or packaged up vox pops here. Everything is written on the day and recorded in-studio hours before airing. Again, the ABC has been promised this is going to work. Aside from being an ambitious television venture, The Roast is also a creative development pool for a new generation of Australian comics who are sick of being unemployed in a country famous for its sense of humour. The Roast screens weeknights at 7.30pm on ABC2 from Monday April 8. Has anyone noticed with the new ten minute version of this show how much slower Tom is talking? It made me realise how ridiculously quick he was going In The 2 minute format…..
How odd the press release says these people have never been on television before. Rachel Corbett was the intruder who got kicked out after two or three days in the first Big Brother, wasn’t she? I’m sure I can find 10 mins in my schedule to give this a look. Not as good as the Onion News Network.